Finally create the netlist using gnetlist and run the simulation using ngspice. 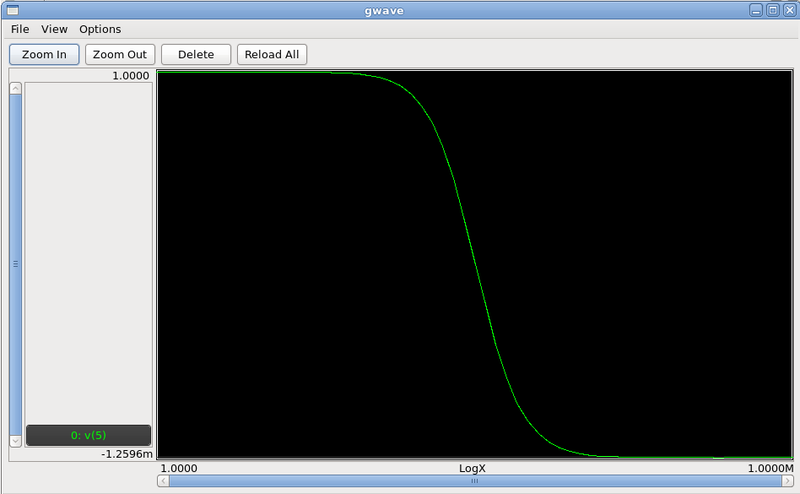 Open gwave with the raw file generated and plot the voltages at the input and output. This is what you should get (click for larger, better picture). Now lets look at the other extreme – a high pass filter. Alright thats it for op-amps. Now lets see what subcircuits can really do. Most of the circuit should be familiar to you. Before we look at the subckt specific sections, noticed that I’ve used Q2N3904 as the model name. 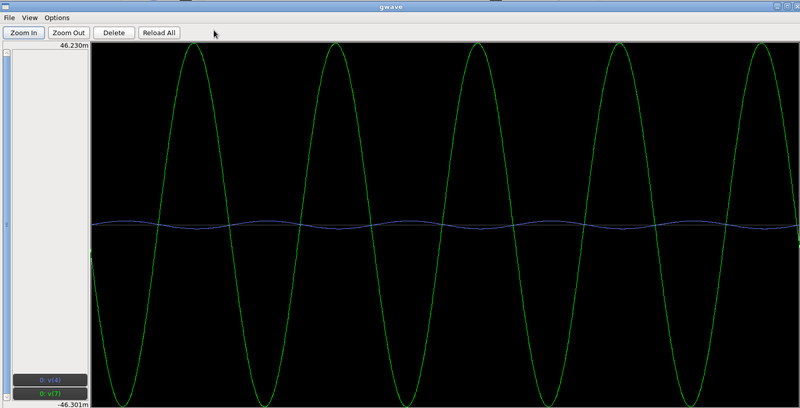 This is because for some reason ngspice doesn’t support model names beginning with a number in subcircuits. So make sure you make a copy of the model file for this BJT and change the filename and model name accordingly. There are two symbols here which are specific to a subcircuit. The first of these is spice-subcircuit-LL-1.sym. You can get this from the SPICE simulation elements section. This component tells gnetlist that the circuit we’re making should be translated to a subckt and not a netlist. Select and place this symbol and set its model-name to amp. Make sure the pin sequence numbers are in the right order. The device attribute is amp and the refdes, as you can see, is X?. All subcircuit reference designators must begin with X. Save this to the symbols directory we created last time and exit. Don’t think I need to explain much here. You know what settings to put :). 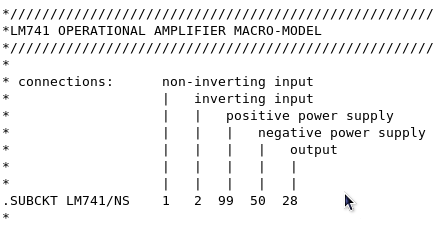 The amp symbols just need the model-name to be set to amp. Later on, as you create more amplifier circuits, use the same interface (i.e. 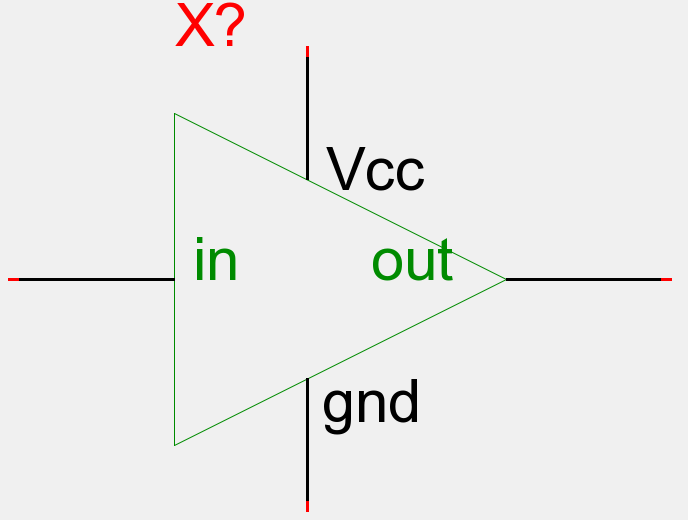 input – Vcc – gnd – output) and the same symbol. The holds for any other symbols and subcircuits you make. Simplifies things a lot doesn’t it? :). Lets have a look at one component we’re coming across for the first time – vcc-1.sym. This is available under the Power Rails section – same place where you get gnd-1.sym. All you need to do is set its value by connecting it to a voltage source as shown. Then connect it to all the Vcc inputs in your circuit like I have done for this circuit. 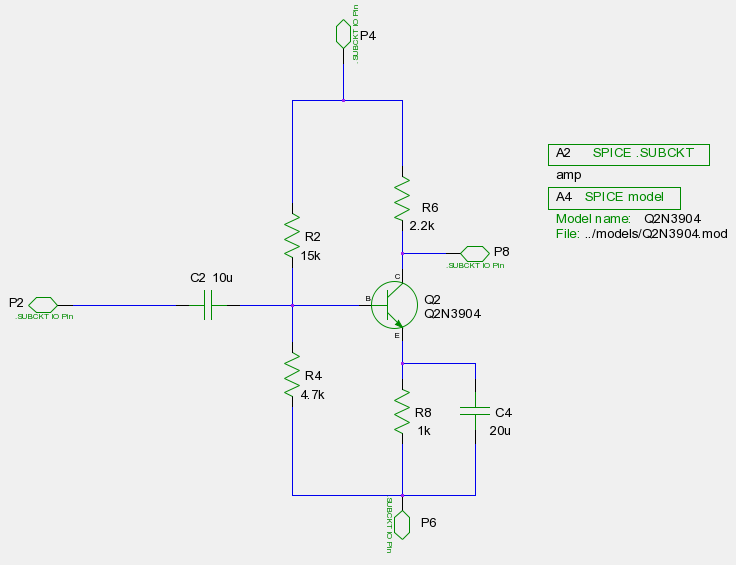 Can you throw some light on how to write hierarchial spice circuits in Hspice? Example using a few gates? Unfortunately no. But isn’t it the same as just using SPICE? I always thought both used the same syntax. I’ve never used it and I don’t think I will be able to (unless synopsis chooses to give trial software) since I don’t work on the analog design side. Did some searching around and it does seem the same thing. Have a look here. But I can’t verify this since I don’t have the software. Thanks a lot for those great tutos ! – I don’t know if I’m doing something wrong or if TI changed their spice model but I had to set model-name to LM741/NS instead of just LM741 to have it working. – ngspice has to be compiled with the x-spice option to understand the POLY statement included in the LM741 model. This was not the case for me with the Mac OS fink version so I had to rebuild by hand..
Could you send me the link to that model file? Let me have a look. I don’t know much about how ngspice was compiled in Fedora. I’ve never had to compile any Linux package so far. Thanks for pointing it out. Ashwith, a great tutorial. Thanks for the time and effort. I tried to add my own symbol to the existing component library as per your blog post. gEDA/gschem comes with ABSOLUTELY NO WARRANTY; see COPYING for more details. conditions; please see the COPYING file for more details. Note : gafrc was not exisiting I created a new one in gEDA. I copied as exising part symbol to my.sym and modified and I was able to use it. Do you know any better way ? 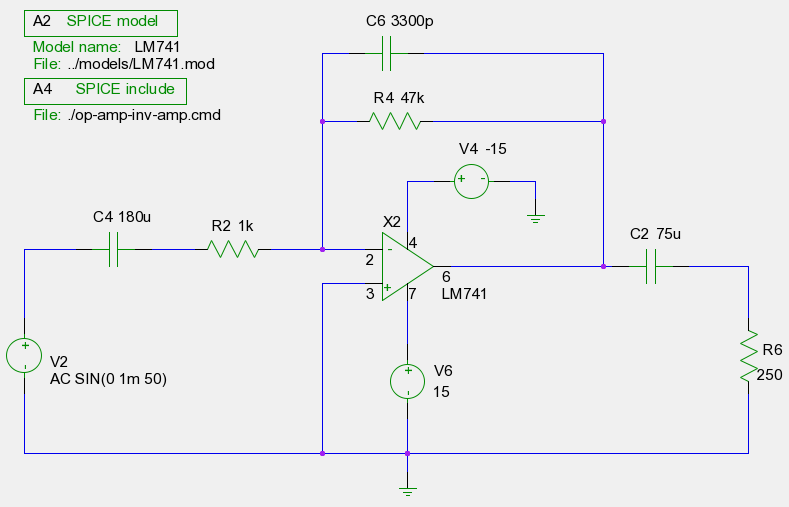 Example – 4 Two Stage BJT Amplifier ?. I tried downloading example files and it was not working over my system. 2. Also symobols were offgrid I am suspecting some version mismatch also. thanks for help and nice blog. Could you please upload your gafrc and give me the link so that I could take a look? I remember having a similar problem which I solved by just re-typing it fresh. I forgot to investigate the reason. I’d like to have a look at your file. Maybe you’re facing the same issue I did. I’ll download the zip file and check if it works for me. It’s quite possible I’ve made a mistake somewhere. ; NOTE: Some of the below component libraries below are commented out. since that is the path for the symbol which i created. Please upload the file. Do not paste it here. The problem is that on WordPress, one of the characters gets changed. So I won’t be able to see the real contents of your gafrc. 3. To add your symbols library, add the a line like the following (this is the actual line I am using). Do not copy this. Type it out yourself because in the past, WordPress has converted the ” characters to something else. 4. Save the file and exit. Now open gschem and see if your symbols are loaded. The one in /usr/share is probably a global gafrc which can set common settings for all users. The one in your home directory will be specific to you. I am able to create symbol for Inverter and was able to instantiate it on to a new schematic, but if i save that schematic and open it from within gspiceui, I see a warning message on the symbol as symbol not found, and I am not able to see symbol library under add component. I am defining gafrc file at the place from where I am running gschem and it works fine for stand alone gschem but not with gschem from within gspice. please help. You should probably see a gafrc file there already. Just edit that one. Above is ngspice.tr file, now if you see V(s2) and V(s3) transient values are not appearing if i have 7 nodes which I am trying to print. But, If i only pick V(s2) and V(s3) i.e. total of 2 nodes it prints fine. Bottom line is I am not abe to read ngspice.tr file in gwave and i want to see all bits altogether. Do you know if there is a limit which we can change so that i can print more then 5 nodes in .tr file? I assume there should be some setting in ngspice .. please help. the just above 3 values are time, v(s2) and v(s3) and i think if this gets printed after v(s1) than gwave will red them properly. Bottom line is do you know how can i print all nodes straight in one line, i think .WIDTH default 256 need to be increaed to 512 or more to have every node in one line. Do you know how we can add options through a separate file, like .include? Hey Ashwith, I found out the cause.. and resolved them. I am able to print all 16sum bits now..:) thanks..
Hi Mandeep. I’m glad you were able to figure this out. Sorry for not being able to reply earlier. I have very little free time nowadays. 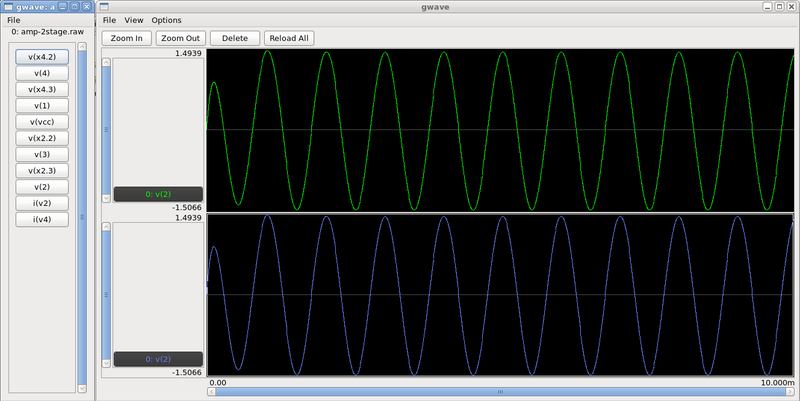 Hi Ashwith- Sometimes after I finish a circuit in gschem, I may replace a component for some reason. But when I do, the new generated netlist doesn’t work, evidently because the order in which items are added to the circuit has changed. You mention this in an earlier blogpost. I can, of course, edit the netlist manually, but that doesn’t fix the .sch file, so that I can no longer generate a new netlist using gnetlist on the changed schematic. Do you know a fix for this? Also, did you ever figure out Prajwala’s problem (a few comments above) with configuring the component-library? I have the same problem- no matter how many different ways I try I cannot get gschem to find my symbols. I have tried it several different ways with no luck. Can you help? It looks like the current version of gEDA works differently. I’ll need to update my tutorials (which I can do only after Feb). The documentation shows the forward slash http://wiki.geda-project.org/geda:gschem_ug:config. I also just realized the links at the beginning of my symbol creation tutorial no longer go to where they should. I’ll fix that right now as that will mislead anyone who reads it. Thanks for pointing this out! Hi Ashwith- thanks so much! In February when you get time, you might also consider: the amp-2stage.sch file in your zipped examples is wrong/broke/incomplete, not sure. It has missing and disconnected nets. Also, you might consider including the symbol file for that example (Example 4) , that would be helpful. I’ve had a lot of trouble getting that example to work… it may be that I am confused about the pin sequencing of the symbol. My netlist for amp.sch shows the included code for amp.mod but doesn’t mark it as a subckt! Even though I do have the appropriate SPICE SUBCKT command in amp.sch. I’m still working on it, hopefully I won’t need to bother you about it. When I plot V(4) and V(7) using interactive command-line ngspice, my simulation result is the same as yours. I am still wondering where V(4) and V(7) come from . Why V(4) and V(7) ? Firstly, sorry for the really (really!) big delay for a reply. I wrote this tutorial while I was still learning ngspice so I’m not sure what I’ve done different. Have you been able to fix the problem? I’ve moved to naming important nodes. So in gschem, important nets (such as those at input and output) would have a netname attribute added with the value equal to the name you’d like to use. This replaces the nodes numbers in the netlist with names which in turn saves me from a lot of confusion. 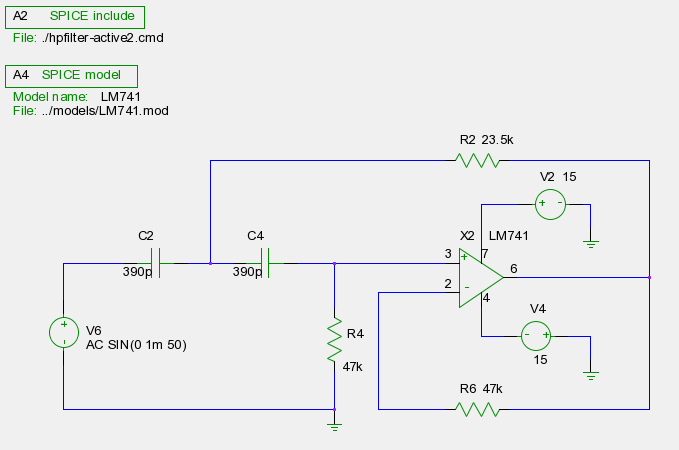 For the life of me I cannot figure out what to do after creating a symbol for the MCP6022 opamp. I’ve downloaded a model file (.txt) but how do I connect that to the symbol I’ve created. Your tutorial skips over this step and it has left me utterly baffled.